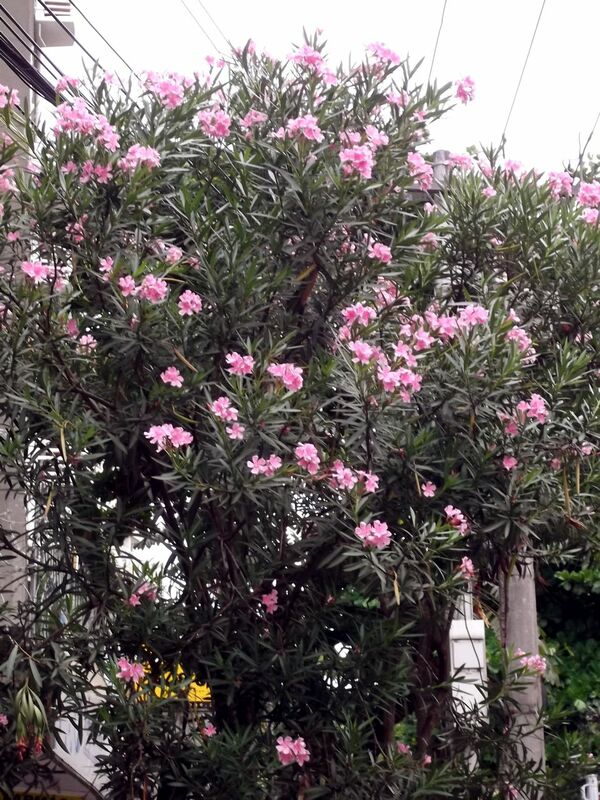 One of Rio’s most attractive features is its trees. The city is covered with them, though the number of species used for the streets is limited, whereas Rio’s Jardim Botânico has over 6000 species of trees and plants. Among the most popular trees is the “amendoeira”, or almond tree, though the nuts on this particular species are not edible by humans. The advantage of the tree is the way it spreads its branches, and its wide leaves, thus providing good shadow. The disadvantage is that the leaves are very sturdy, and when they fall, and have to be cleared away, the city cleaning department – Comlurb – has difficulty in mulching them – they take a long time to break down into compost. Another popular tree is the Cannonball tree, otherwise known as the Ayahuma or Couroupita guianensis – common local name being abricó-de-macaco, which has beautiful flowers that grow on the trunk, but otherwise seems highly unsuitable as an urban tree, as the fruit that follows the flowers consist of balls literally the size of cannonballs. One has to give the tree a wide berth when the fruit is ripe, as the balls are heavy, and when crashing to the ground I imagine would do a lot more damage than, for instance, a coconut. Another tree popular with the authorities is the ficus. It is an ornamental tree of exotic origins, coming principally from Asia, and planted in Brazil since the end of the 19th century. Once again, it is not very suitable for the urban environment, as it has powerful roots that travel long distances and uproot pavements, walls and even houses. Examples are the Ficus benjamina, the Ficus microcarpa, and the enormous false rubber tree, the Ficus elastica. The bugs are tiny, slender insects with fringed wings. Other common names for thrips include thunderflies, thunderbugs, storm flies, thunderblights, and corn lice. Thrips species feed on a large variety of sources, both plant and animal, by puncturing them and sucking up the contents. A large number of thrips species are considered pests, because they feed on plants with commercial value. The word thrips is from the Greek, meaning “wood louse” (Wikipedia). 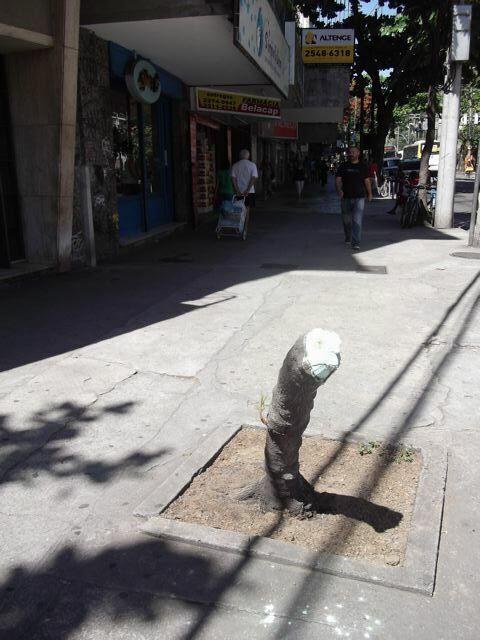 The government bodies responsible for looking after the trees are the Fundação Parque e Jardins (FPJ), the Municipal Urban Cleaning Company (COMLURB), and the Prefeitura – City Hall. The FPJ is in charge of maintaining 2,000 parks and praças, but does not prune, trim, remove or plant trees in Rio’s streets. 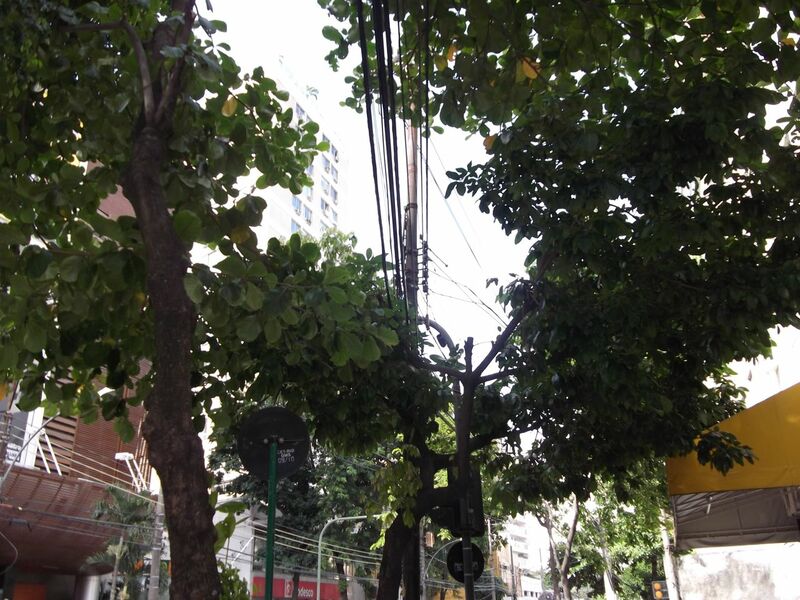 This is done normally by COMLURB, although here another public utility must be mentioned, as the Light, Rio’s electrical power supply company, also trims the trees when they reckon they are interfering with the aerial cables and wires, which are still an unfortunate eyesore on the streets of Rio. As the photos show, the Light are not always considerate of the tree itself when they trim. Even Comlurb, responsible for the routine maintenance and pruning of the trees, is anything but skillful, and the trees suffer as a result. Fundação Parques e Jardins is the body with the technical and scientific knowhow, but they concentrate more on the planting of new trees. If you have trees on your property, and they grow too large (such as mango trees), you have to get FPJ permission to trim them, and if you want to remove a tree, yet another government agency has to be approached – IBAMA – the Brazilian Institute for the Environment. Over the past five years over 100,000 trees have been planted by the FPJ in Rio. Last year, over twenty endemic species where chosen, many being fruit trees, and FPJ broke its own record by planting 29,000 trees. 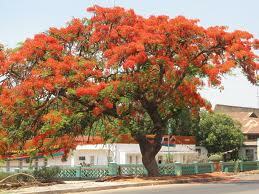 In general it is felt that there is a lack of endemic trees, and all over Brazil trees not original to Brazil are used to decorate the cities. Belem do Pará for instance is famous for its mango trees, which are not endemic to Brazil. 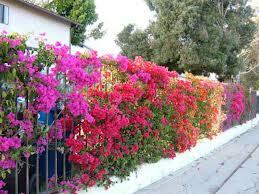 One of the most colorful in Rio is the Flamboyant, which is planted all around the Lagoa Rodrigo de Freitas. These trees have long slender branches, with leaves like ferns, and have to be carefully trimmed so as not to lose the colorful effect when they are in bloom. Shocking, eh? However, I discovered that it had broken, probably in one of our recent storms, and a local resident – a botanist – had cut it off and is treating it so it will grow again. It is already showing some new shoots. She eventually planted a new tree there, and it is doing well (June 2016).